In the case she was concerned with, she was quite right. There are workarounds for complex MS Word documents with footnotes, but none of these are really optimal for a team working simultaneously in several different CAT tools. In the case of memoQ 5 (which was part of the mix) the lack of support for footnotes in RTF/DOC bilinguals made it impossible to review an uncleaned translation done in WordFast Classic (not a problem for simpler files), and the use of a bilingual DOC export from memoQ used the "simple" format of one segment per line, thus losing the format for the working translator. I hope that will be dealt with in time by Kilgray's developers. But fortunately, interoperability really does work - it is "the art of compromise" as one industry guru put it, but there are many acceptable compromise strategies that allow productive collaboration, and memoQ excels in this regard more than any other tool I know. But as I have said so often, we need a broad palette of tools to enable us to handle any job efficiently, and last week's project here was a good example of this. No good deed goes unpunished, and my punishment for an almost miraculous rescue of the editing and harmonization of a large, complex financial report done in a hurry by several translators, some of whom don't use CAT tools at all, was that I got to do the update of that text and see all the little stuff we missed the first time around when the client CEO and I traded sleep for coffee and Excel spreadsheets. Actually, I loved that job, and I was proud of what we could accomplish in 48 hours that should have taken a week or more of overtime. All of it possible only thanks to memoQ LiveDocs and the QA module. And lots and lots of coffee. In this round, however, I was determined to avoid some of the pain caused last time by file format problem. The Notes to the annual report contained about 30 embedded Excel tables in a Word document. "So what?" says the user of Star Transit or DVX2. "Uh oh!" say the Trados and memoQ users. This is where interoperability saved me hours of bother. I'm no longer comfortable doing routine work in my former preferred tool, Déjà Vu. The working environment of memoQ is more ergonomic for me, and although I still miss a number of very useful features in DVX, on the balance, the features I gained in memoQ allow me to do many more things better (or even at all). Nonetheless, this time Atril had the clear advantage. I translated the main text of the Notes in memoQ, making full use of my translation memories, glossaries and QA settings there. I enjoyed the previews of the embedded Excel documents, which gave me necessary context for some of my work, but the actual content of those tables was untouchable in memoQ. 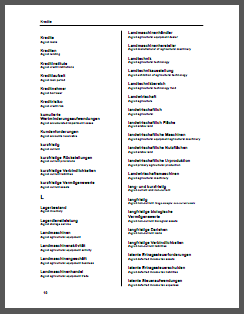 Then I exported the translation, which was an English document with embedded tables in German. This compound document was then imported to DVX2 together with my TM. I copied the source to target, locked all the English content (it was helpful that the content extracted from the Excel tables was at the end of the translation scroll) and pretranslated what remained from the TM. Less than an hour later I exported the completely finished translation - and saved a lot of fiddly work exporting and importing those stupid tables like I had to do before. I really do hope that memoQ's filters for MS Office documents will be updated to handle embedded objects soon - it's not uncommon that I have Excel, Visio or PowerPoint objects stuck in my Word documents. After delivering the text, I then turned to the next task: exporting my terminology. Once again, interoperability came to my rescue here. This customer places a lot of importance on the correct use of IFRS and their own terminology. One of the ways we coordinate this is to exchange glossary information in a format that this customer, who doesn't know a CAT tool from a Persian feline, can cope with. A nicely formatted DOCX or PDF dictionary does the trick. But I can't do that with memoQ. I've been advocating the addition of XSL script selection to memoQ's XML term export for some time now. My own efforts to create good scripts for my purposes are hampered by the fact that I haven't done much programming for a decade now and I've lost most of my skills. So until I sort that problem out, I take the terms in XML from memoQ and import them to SDL Trados MultiTerm. MultiTerm is unique among the terminology tools on the low end of the market in that it has always offered some useful export format templates (which can be adapted) for re-use of the term information in other environments. Formatted RTF dictionaries like the one shown here as a thumbnail, web pages, custom text exports... the sky's the limit if you can deal with the odd configuration options and unexpected crashes. Having traversed that minefield often enough in the past decade, I can usually produce something good-looking from my memoQ terminology with SDL Trados MultiTerm without much ado. And my clients like it a lot more than an ugly CSV export. So why didn't I just use Déjà Vu or Trados in the first place? Re-read the text above. None of the three CAT tools I use was capable of doing everything I required as efficiently as I needed it done. DVX2 came the closest, but the lack of a preview, the primitive way that tags (codes) are still managed and the lack of comfort I feel translating in that environment (I'm much slower now) made it a poor option for the bulk of the work. But working in carefully planned concert, these three tools produced excellent results, made my client happy and made me happy by saving the rest of my day with an early delivery. There was one rather bizarre follow-up to this job. Due to a problem with how my MS Word installation displays embedded objects lately (just a field placeholder - no idea how it got switched and no idea how to switch it back), I can only see the Excel tables embedded in a DOCX if I go into "reading" mode. So I didn't notice that the views of the embedded tables translated by DVX2 were not updated on export. I ended up having to open twenty-nine tables in the document to refresh them and let the translated English text appear. Surprise, surprise. I tried to comment on your blog, but it seems to have swallowed up my comment (twice) and sent it to the digital happy hunting grounds. The trick to refresh the objects automatically lies in the Word menu 'Déjà Vu X2' and is called "Refresh all objects". That would have saved you 29 clicks. (And yes, it fooled me, too, the first time I used it). David Turner (the CodeZapper guy) had mentioned something similar yesterday and commented that this function really ought to be an export default. I can't see any reason to disagree with that. That reminds me, I need to talk to the Atril folks to see where they are on Translation Interoperability Protocol (TIP). TIP won't solve every last interoperability problem in our industry, but it will reduce the headaches by a factor of 8 billion percent (yes, I realize I'm being conservative with that number).